OK, well perhaps these days, there’s not so much rubber in new stamps LOL! I love this image and fantastic sentiment from Magenta. There are so many options for it. So today, I chose to ink it up with Memento’s Tuxedo Black and then add some sponging. My colors came from the Color Challenge on SCS – So Saffron, Blushing Bride and Certainly Celery. Then it was time to add some bling using Crystal Stickles. No other embellishments today. Pretty plain and simple. 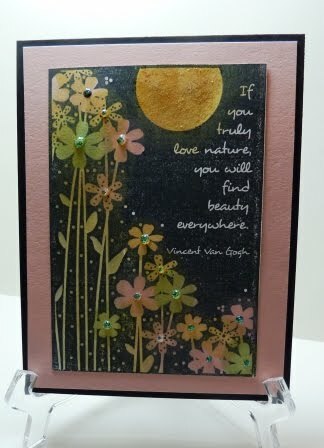 The image was layered on Stampin’ Up! Blushing Bride and then on a standard A2 card.